It’s no secret that one of my passions is interior design and home decor. 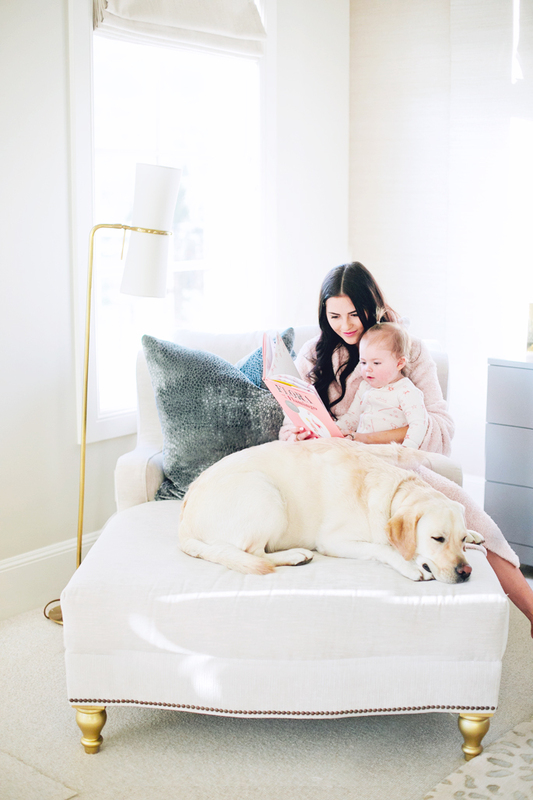 I always get SO many questions about the decor throughout my home whether it’s my kitchen, bedroom or Isla’s nursery (which is why I added the new ‘Home Decor’ section on my blog to make it easier for you to search for. You can view that here!). Drew is a builder and he was actually the general contractor on the home we are living in now. We spent hours and hours designing our home from scratch together and now it’s been so fun to see something that we built together two years ago turn into our home where we are raising our family. If any of you have every built and tried to furnish a home, then you know it’s constantly a work in progress. There are still areas that aren’t completely done, so I’m always looking for accessories and furniture to finish up each room (one day I’ll do a full home tour, promise!!). 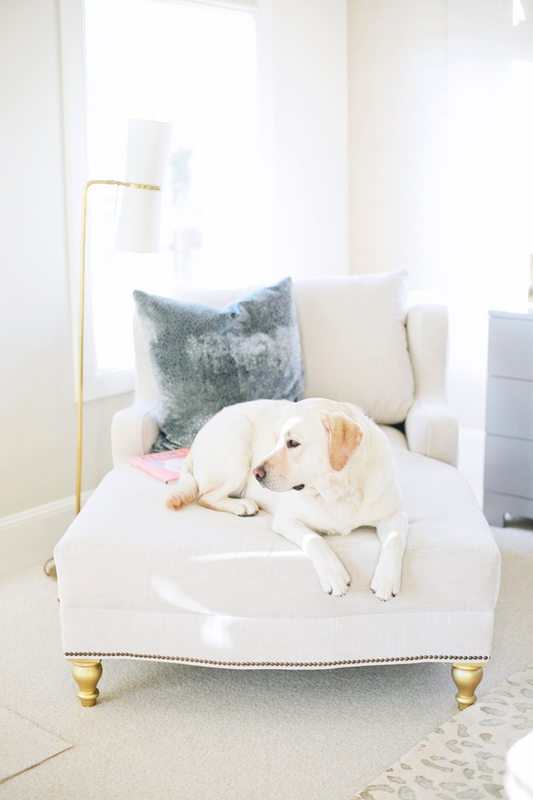 We added this chaise to our master bedroom about a year ago and it’s now a place that I’ll work from in the mornings with a cup of hot chocolate, a place where Dash will take his naps or a place where I’ll cuddle up to little Isla and read her stories. I found this floor lamp and these gorgeous faux flowers (we all know I have a thing for having flowers in my home – real or not real!!) from Horchow and they complimented this little nook perfectly. 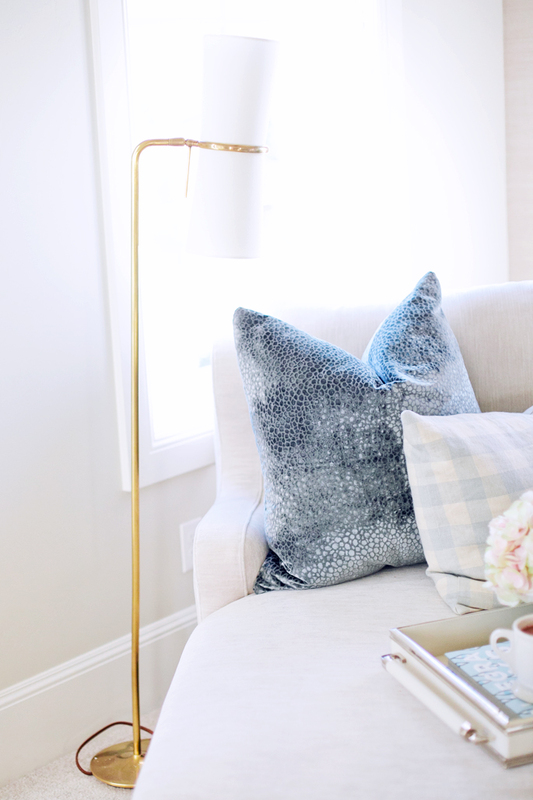 I love finding pieces that help make our house feel more like a home and these two pieces did just that! Here are more pieces from Horchow that I’m dying to add to my home (and most are on sale an extra 20% using code MEMORIAL)!!! Also, a lot of you have asked about the full-length mirror in my bedroom. I found an almost identical mirror on Horchow, it’s pictured below and it’s on sale too! Have a great Tuesday! Brought to you by Horchow and ShopStyle. Your home is so beautiful! Is your mirror wider than the horchow mirror? Also, what carpeting did you do in your bedroom? We need new carpeting and I’m on the hunt for a good recommendation!!! I believe the Horchow mirror is smaller than mine, but it’s super similar and it’s at a great price!! And the carpeting is actual a custom wool carpet. If you’re interested in it you could reach out to Caitlin Creer and get more info. Oh my goodness… I really love it, Rach! I can’t wait for the whole home tour! :) Happy Tuesday to you too! Such a sweet photos!! I love your bedroom! Where is your light leopard rug from!? I looked in the home decor section but was unable to find anything! 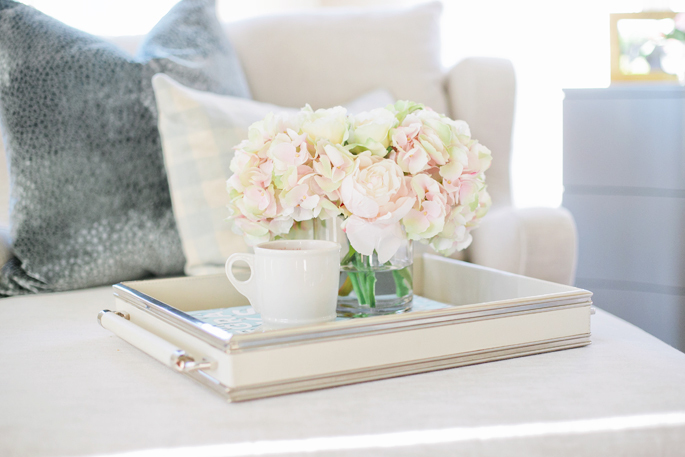 This is so beautiful…what a peaceful little nook in your home! Beautiful! Love all the bright white. Rach, I cannot wait for you to do a full home tour! You and Drew did such a wonderful job building your home. Although it’s a large home, you’ve managed to create that homey feel, which can sometimes be a challenge when working with such large spaces. I love this little nook area you’ve created, the chair look so comfy! Thanks so much for sharing and I hope you’re having a wonderful start to your day so far! Thanks Jalisa!! I know I really need to do a home tour :) Stay tuned! I love that chair! And your daughter is SO cute. Thank you so much Marisa! You have such a beautiful home! Thanks for sharing. This is such a bright airy corner, love it! Really lovely… I adore Horchow! My desk is from there! It’s gorgeous! So sweet! I’m obsessed with Horchow – they have some really great pieces! You have a beautiful home. My husband and I are currently remodeling/decorating our home and I often use your photos as inspiration. Loving the pillow on the chaise, do you recall the designer/store? Also, congratulations on baby #2! Hi Jessie! That pillow was actually custom made, but there are similar ones at Horchow! Good Luck with remodeling your home! Indeed a cozy corner! You two are cute!! This looks so nice! Especially for cozy mornings or unwinding before bed. Love this concept! Right?! It’s our new favorite spot :) Thanks for dropping by Mollie! I love seeing little sneak peaks of your home, Rachel! Absolutely stunning, and looks so so cozy! We’re redoing our home slowly but surely, and I get so much inspiration from your home :) Can’t wait for a full tour! I love the new furniture and your house is so gorgeous. Dash looks like he is enjoying the new pieces too! Such a great little cozy corner. I absolutely love the details. Isla’s ponytail!!! Such a cutie!! It looks lovely and so cozy! I love your home style! All the colors are so lovely! GORG! I apologize if I missed it, but where is the chaise from? Found it! Never mind! Sorry! What a beautiful and comfy looking chair! Horchow has the prettiest home deco items. You have such a beautiful home! That looks like the coziest little reading nook! I love comfy, oversized chairs like that. Looks like a lovely spot. These pics are all so pretty…Isla, the flowers, and your doggie. All so gorgeous! that looks like such a comfy and cozy nook! Such a pretty little nook, I love the lamp! Oh my gosh! Thanks so much Wendi!! Being a mom has been the best thing and I’m trying to enjoy every second I can!!! Aww such cute pics of Isla and Dash. Lovely post – I adore your home! 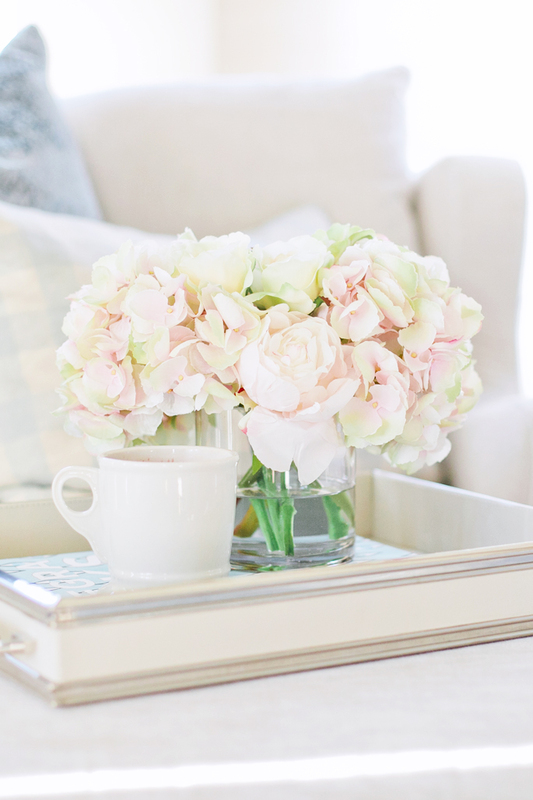 I am particularly in love with the tray in this post – are you able to let me know where it’s from? Thank you! Would you mind sharing your paint color for this room? I love it! These pictures are so beautiful Rach ? I need a great cosy corner in my house just like this one. Beautiful tray….where can I find it? I was wondering where you got your chaise … is it from Horchow? Love how cozy it looks! Hi Rachel thank you for sharing your home. I love it!! Where can I find the chaise? Where can I find the chaise?